I'm wading through about sixty-plus screeners (and counting) as we head into the end of year awards season. What I'm really saying is please forgive me for allowing the blog to lay fallow. With two kids to watch after while my wife is running our business and a hard deadline for voting for the upcoming Online Film Critics Society awards I've neglected the blog. I'm going to compromise a bit then and post some quick and dirty capsule reviews as I catch up on 2012 films (and if you're lucky, I may preview some as well... including one in today's post). The first crop comes after the jump. 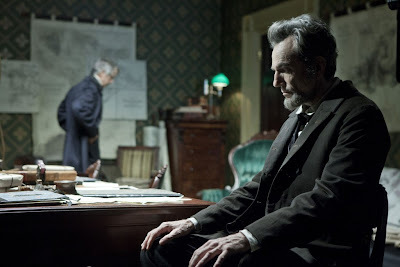 It's a rare occurrence when a preview screening plays to a nearly empty house, but a preview screening of Lincoln that I attended last week did just that. It's not entirely surprising since it played in an Atlanta suburb. The schizoid nature of the metro Atlanta area is such that though the city proper is a stronghold of the African-American Civil Rights Movement (fully reflected in the diversity of its population), pockets of areas outside of the I-285 perimeter still have a lot of catching up to do. It was only 2 years ago that the Daughters of the Confederacy un-ironically set up a booth in my own suburb's annual Main Street parade. Things are changing, but not at the speed one expects. One week post-election and roughly one half of the country still feels steamrolled by the Democrats' top-to-bottom victory. And into this comes Lincoln, a movie centered on the enfranchisement of a subjugated people during the most divisive era of our storied history. Since I've got Bond movies on my mind, here's an infographic sent to me by the folks at CableTV.com. There are a few mistakes here and there, but otherwise it's neat. Click to enlarge. One of the most arresting images of the entire James Bond series is the sight of Sean Connery, THE iconic 007, laying dead and bloody in a bed. The shocking scene occurs even before the opening credits roll on the fifth of the 23 "official" films based on the Ian Fleming spy novels. For this and many other reasons, You Only Live Twice is a watershed movie in the series. The Death of Bond is a potent trope that has and will be repeated again throughout the 007 series. Bond's death and subsequent resurrection not only foreshadow the handful of times 007 would be regenerated in the performance of another actor; they also look forward to Connery's departure from the role before returning to it in Diamonds Are Forever (1971) and again in the "unofficial" Never Say Never Again (1983). Watching the schizoid You Only Live Twice—satisfying in some respects, frustratingly comic in others—is instructive in explaining why Connery was getting fed up with the series and how the Bond movies would eventually stray quite far from their source material before its triumphant reboot decades later.